I’m on a roll and yesterday and todays’ post are my favorite Singapore restaurants so far (in the almost ten months we’ve been here). Luke’s has been around for some time with its’ original location near hip and happening Club street well-loved by many for the food, the drinks, the ambience and the fact that the kitchen stays open till midnight. The new one opened a few months ago in a strange spot inside the renovated Robinson’s department store at The Heeren building. Once you walk through the store and enter the doors of Luke’s, you realize why the location was right all along. The place is sleek with black leather banquettes and cozy mini-booths for two lining the upper level and a long bar on the lower level with a floor to ceiling window overlooking busy Orchard road. The menu is simple and spread out over two pages – one with items from the oyster bar, table snacks to be shared, a caviar service and starters then the second for chophouse classics, chops and side dishes and a listing of specialty beers and cocktails. The wine list is extensive with eleven of them, from sparkling to fortified, served by the glass. As soon as the order is placed, a plate of warm mini-cornbread served with a dab of sweet butter is served. From the winter 2014 menu, we shared the smoked trout dip with crackers, celery and radish – a smoky almost dry shredded trout which we spread onto the accompanying extra-thin brown crisp bread and the oysters “lukefeller” (instead of Rockefeller) – baked oysters with spinach, Pernod and parsley. It was hard to choose a main course from the selections offered but as I hardly get to eat steak tartar, its what I had even if it was listed as a starter. This one came perfectly seasoned and chunky with capers along with toasted slices of rye bread. A had a well-seared veal chop with anchovy marmite butter. We shared several sides – the extra crispy Old bay seasoned french fries, green asparagus and the creamy lobster mac and cheese topped with ritz cracker crumbs. 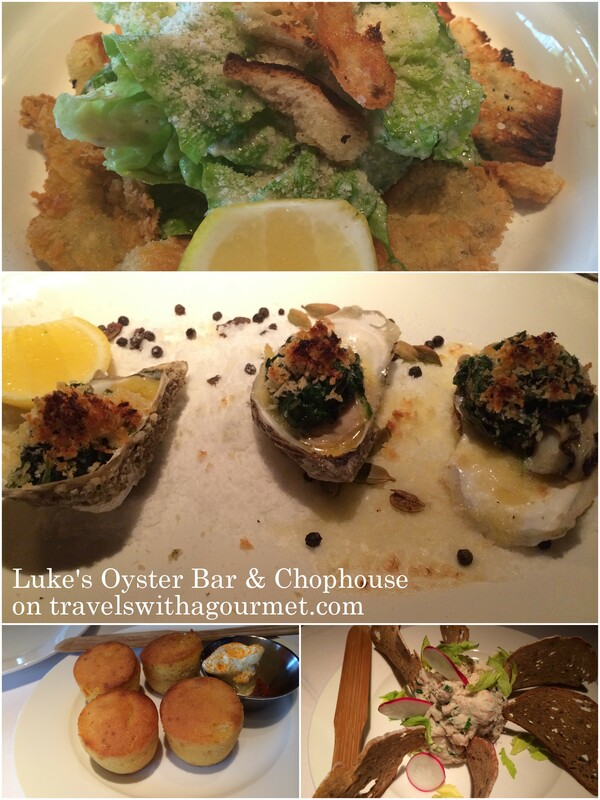 For lunch one day with the ladies, I had a delicious caesar salad topped with fried oysters. There are also a few specials (like their famous hamburger) not available for dinner. On another occasion, four of us dined on a couple of starters (tuna tartar and the smoked trout dip) followed by two orders of 400 gram USDA prime rib-eye “naked” (meaning just with salt and pepper) and a tableful of side dishes. Desserts are few and the two we tried were ok but nothing to write home about – it’s the only thing they could improve on. 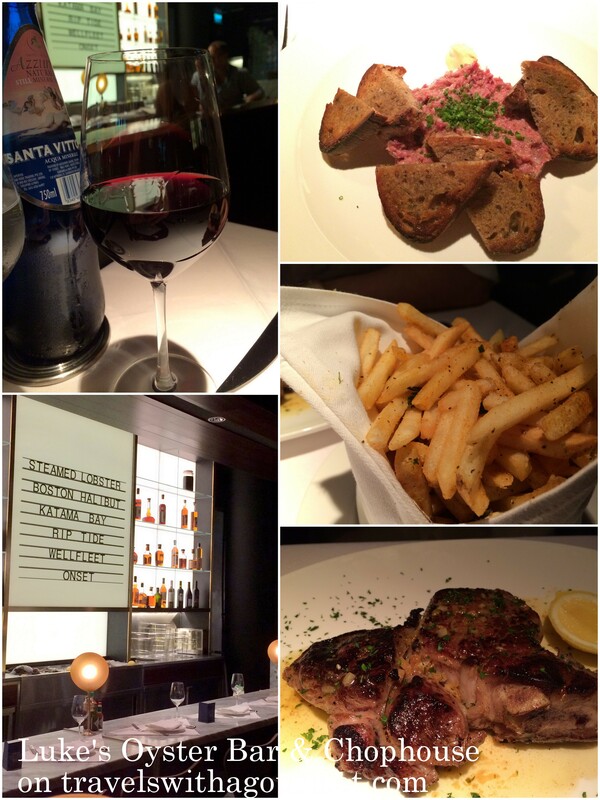 Otherwise, the service, the atmosphere and the food are outstanding. At Luke’s, there is always something delicious to eat with no surprises or gimmicks, just real good food served simply. *Open Mondays to Saturdays from noon to 10:30 p.m.